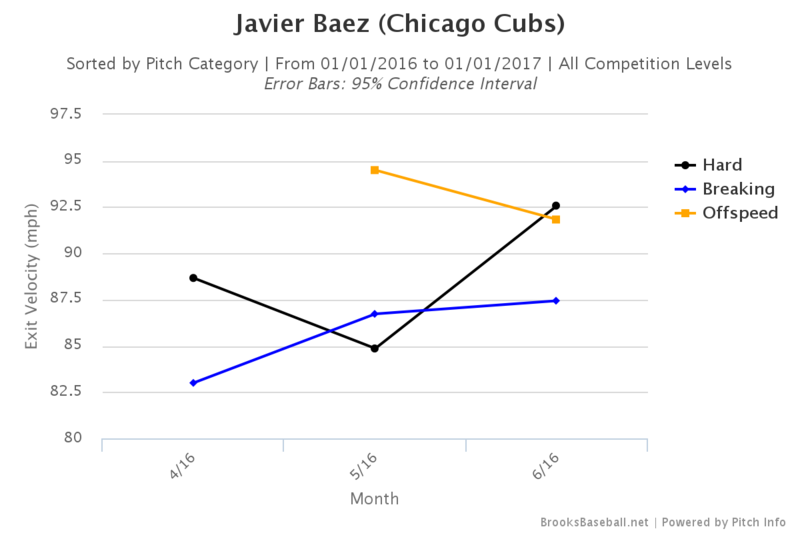 In my last article and the one before it, we discussed Javier Baez's approach at the plate. We're going to discuss the same things again today. Yes, this my third consecutive article that is about Javier Baez. Deal with it. I swear I will write something about another player at some point. There's a few reasons I am so heavily invested in documenting Javy's plate approach, though. He's a fascinating baseball player, for one. Secondly, I could tell you how good Anthony Rizzo is at hitting baseballs, but we all know that already. More importantly, today, is that all of that stuff in Javy's approach that I rambled about previously... well, there's been some changes already. I keep talking about Javy's plate approach because that's the one unknown with him. We know there's power in his bat. We know that he can play defense. He's got range. He can make plays with his glove. In fact, sometimes all he needs is his glove. Other times, he doesn't even need to use his glove. We've seen him use his athleticism to somehow contort his body to avoid a tag. Twice. We've seen him use his lightning-quick hands to apply impressive tags. He possesses the grace of a gymnast from an Eastern Bloc country and the ferocity of a wild boar. Let's cut to the chase, though. I am writing this because Javy's walked 4 times in the last week. This might not seem like it's anything to write an article about. But Javier Baez has only walked 7 times all year. Over half of his walks have come in the last week. He also struck out looking twice yesterday. This might also seem insignificant, except that, before yesterday, he had only struck out looking twice all season. That's right, he matched his season total in strikeouts looking in 3 plate appearances during one horrible, awful afternoon. I mentioned in my previous articles that Javy was averse to striking out looking. Don't believe me? Here is a log of every single one of his 162 plate appearances this year. There's only 4 strikeouts of the looking variety in there, I'm telling you. Anyway... walks, strikeouts looking. What the hell is going on here? Let's go back to June 15th, and check out Javy's plate discipline numbers since that date. His swing% is at 44.7%, which is way below his season average of 53.6%. In fact, it's less than the league average of 46.3%. More importantly, his O-Swing% (the percentage of pitches that he swings at out of the zone) is at 33.3% during this period. He's at 43.2% for the year in that category. So he's been swinging less and, more importantly, swinging at balls less. Clearly, this means very little, since it's only 26 PA. Also, I absolutely cherry picked these stats. It's the only time he's really shown any plate discipline all year. So it was pretty easy to cherry pick these dates. However, there's been some gradual improvements in his plate discipline that led to this sudden barrage of 4 walks. Here's a chart of his rolling 15-game averages in some key areas. Until last week, the BB% wasn't budging. But, look at the O-Swing%. 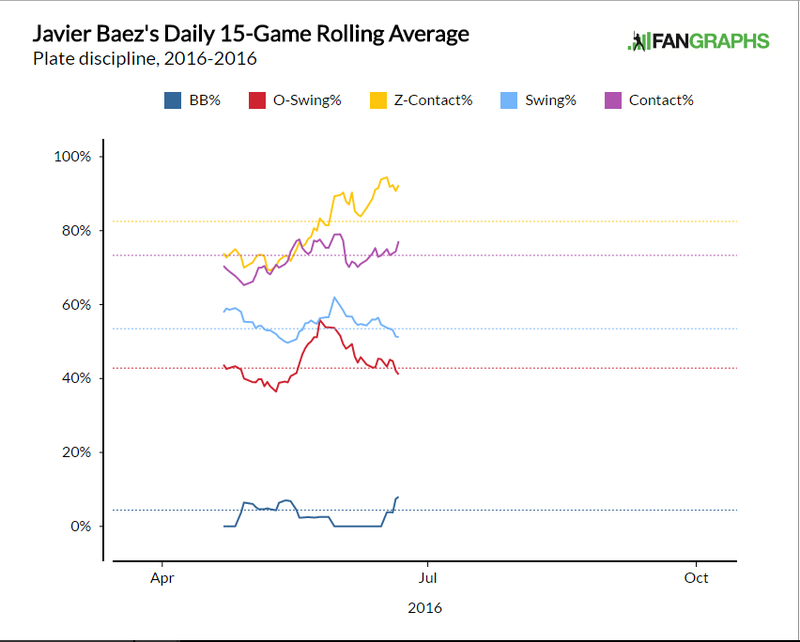 It's been trending down for a little while, as has his overall swing%. It may have been hard to notice (hell, I didn't notice), but it's been happening. I also included his contact% and Z-Contact% (percentage of pitches he swings at in the zone and makes contact with) on the chart, because I want to touch on this, too. You may remember my incessant grumbling in the last article about Javy making the wrong kind of contact -- i.e., contact on pitches out of the zone. I showed that Javy's improvements in making contact have mainly come from making contact on pitches outside of the zone. And then I attempted to show why that is and why that's not necessarily a good thing. Well, his overall contact% has been trending up ever so slightly all year. But, there hasn't been a massive shift in that direction. It's been more of a gradual rise, through some peaks and valleys. But, check out that Z-Contact%. It's rising with the temperatures at Wrigley. This is great news. Pitches in the zone are ones hitters can do damage with most often. I went on and on about this in the last article, begging Javy to wait for pitches in the zone that he can hammer. There's just one slight problem: He hasn't really hammered those pitches in the past. More specifically, he hasn't hammered fastballs in the zone. I touched on this when I wrote about him having trouble with the high heat. He's susceptible to the high fastball. But, really, he's been bad with fastballs regardless of where they are located. Brooks Baseball shows us that he has a career batting average of .191 against four-seam fastballs. His career ISO (or isolated slugging %, taking slugging % and subtracting batting average) is .142 against four-seam fastballs. His BABIP (batting average on balls in play) is .248. This is all bad. Very bad. Despite all the times he's swung and missed at breaking balls out of the zone, he's been rebuffed by fastballs the most. Fangraphs has a section that measures pitch values, which tells how many runs above or below average a player has been against specific types of pitches. Javy's pitch value against four-seam fastballs has continually been among the worst of his pitch values. For his career, he's been worth -2.44 runs per 100 pitches against four-seam fastballs. The only mark on his resume that is worse is against the knuckle curve, which he's only seen in 2.2% of his pitches, compared to 34.3% of the time he's seen a four-seam fastball. That's a major problem. He's possibly the least effective against the pitch he sees the most. In his rookie season, Javy had the fifth-worst wFB/C, which measures fastball runs above average per 100 pitches (for all types of fastballs), of all hitters with 200 plate appearances. This doesn't make sense. Guys that struggle with fastballs are usually the Nick Ahmeds and Billy Burnses of the world. A guy that hit 20 home runs in 54 AA games as a 20-year-old should not struggle with fastballs like this. We heard from scouts and other baseball people throughout his time in the minors that "He has the bat speed to catch up to any fastball that anybody throws." Don't believe me? Take former Cubs manager Rick Renteria's word for it. That article was one of the first google hits for that phrase. I'm sure if you look, you'll find a lot of similar sentiments. Javy was supposed to be able to handle any fastball, because he could stay back longer than other hitters and still have the bat speed to get around on heaters. Jeff Sullivan wrote a whole article for Fangraphs about a young Javy taking an AB against Aroldis Chapman. This is what baseball fans wanted to see: Javy's preposterous bat speed against Chapman's preposterous velocity. Even though he's certainly hit better this year, Javy was still only slugging .353 against fours-seam fastballs through May 31. This is where it gets good. In June, he's slugging .652 against four-seam fastballs. The following charts show Javy's whiffs per swing against what Brooks Baseball classifies as hard pitches. One is for this year through May, and the other is from then on. He's not missing those pitches in the zone as often. His whiffs per swing on these pitches in the zone was 14.7% before June and 10.3% since then. And when he's made contact on hard stuff, he's hitting it harder. As a whole, including all pitch types, in June, Javy's Z-Contact% is 90.5%. This is what we saw on the first graph in this article that sent us down this rabbit hole. The league average contact% on pitches in the zone is 86.1%. Javy's becoming a dangerous man to try to get out inside the zone. We've went too long without me introducing Statcast data. So let's head over to Baseball Savant. We're going to look at all hard pitches inside the strike zone that Javy has seen. Through May, Javy was slugging .227 against these pitches. In June, he's slugging 1.000 against these pitches. Through May, his average exit velocity against these pitches was 89.4 mph. In June, it's 94.8 mph. Let's take the filter off for hard stuff and instead look at all pitches in the strike zone. Through May, Javy was slugging .429 on these pitches. In June, he's slugging .852. Javy has bettered himself as a hitter by hammering stuff in the zone. As a whole, on every pitch, in or out of the zone that Javy made contact with, his average exit velocity through May was 86.2 mph. His average exit velocity in June is 91.2 mph. It shows in his splits. He's slashing .288/.344/.559 in June. His .271 ISO is the highest ISO he's had in any single month of his career. The power is starting to peak out from its slumber. If he can keep his plate discipline trending in the right direction, while also continuing to hammer fastballs in the zone... look out.